Since there’s so much happening at NIPS on a daily basis, I thought it’ll be easier and better for me to table my thoughts and learnings in a post each day. Disclaimer: I’m a distributed systems engineer who’s now interfacing with Machine learning teams. This is why my theoretical understanding of Machine Learning is novice at best. This was the first session by Jenn Wortman. It revolved around some salient points around managing the network. Evaluating topic models. This is especially useful for data exploration and human interpretable summarization of text/audio/video. Human debugging of machine learning models. Useful to figure out the weak spots in the data pipeline. If there’s a huge error between human performance and machine performance, that’s the step to focus on. Human clustering of data. The main idea here is to divide the dataset into multiple sections and give them to multiple people with overlapping. The results are then aggregated using bayesian models. A sample use-case is close captioning of audio in near realtime. The audio is split into multiple pieces and distributed to a network of workers. As earlier, the results are collated and aggregated before being displayed back to the user. Community sourced scheduling. Project Cobi gets humans to help the machine identify constraints within a system. The machine then spits out a schedule based on those constraints. Information aggregation can be modelled as a stock market prediction of people’s beliefs. Predictit was doing this during the USA elections recently. Social behaviour analysis of humans is a very interesting application of crowd sourcing. In the past these studies have helped us identify better representations of numerals and find the cost of bad online advertisements and spam. One of the first things to do while planning to pay workers is to pilot the task with your team, colleagues & peers. This helps benchmark the difficulty & time of the task. Once that is done, pay at least USA minimum wage. Do performance based payments work? Short answer: It depends. If the task is effort responsive (more time leads to better results) then yes, else no. Unfortunately, it’s not easy to figure out which task is effort responsive. Meaningful work leads to more quantity of work done by workers but not quality. It’s incorrect to assume that crowd workers don’t communicate. There are multiple external forums that workers can use to communicate. Also, connected workers find work faster and also produce better results. Create clear instructions. Can include quiz questions if required. Create easy-to-use interface. Pilot this as well! This was a very generic talk (surprisingly, with no maths). The focus was more on the process of developing machine learning solutions rather than the actual maths behind it. An end-to-end deep learning solution is one which follows the form: X —[NN]—> Y. One of the ideas that Andrew touched upon was that not all problems can be solved via end-to-end deep learning. 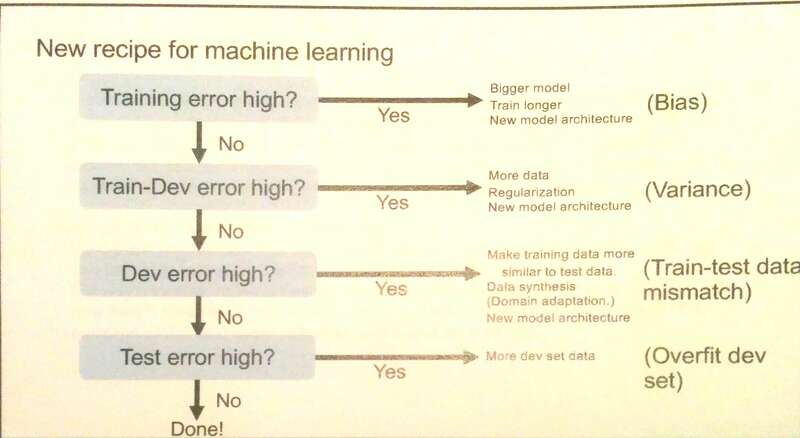 Those problems have to be broken down appropriately and then machine learning must be applied to it. For example, recognizing a face via a security cameras is very hard because the background keeps changing and so does the lighting. Instead, if we take the image, crop out everything but the face, and then apply standard face recognition algorithms, the solution works much better. Read a lot of research papers because this is a fast moving field. Try to replicate results from other papers. Do the dirty work because that’s what gives insights. Generative Adversarial networks are those that try to generate data that fool the original network into thinking that this is original data. It’s like playing a game of cat & mouse. This is a very new area of research and is still very green-field. Fill in missing inputs. Think semi-supervised learning. Multi modal outputs. If we want multiple possible outputs for a single input. Produces the best samples. PixelCNN competes but unfortunately, there’s no quantifiable way to compare this. The basic terminology is that there is a Generator network that creates data. This data is then fed into an actual model (Discriminator) whose job it is to mark these data points as false and thereby re-inforce itself against such inputs. Labels improve subjective sample quality. Don’t smooth the negative labels. Basically smooth only the data and not the generator values. Doing this will cause the system to reinforce current generator behaviour. Balance the Generator & Discriminator. Usually the Discriminator wins which is a good thing. Again, this talk was great in providing a lay of the land in the machine learning world.